1. Separate the eggs in two bowls. Whisk the yolks with the Parmigiano Reggiano and some seasoning. Whisk the whites until soft peaks form. Fold into the beaten yolks. 2. Warm a 22-23cm non-stick frying pan over a medium heat. Melt the butter, then add the egg mixture. 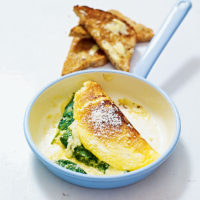 Cook for 3-5 minutes, until the base is golden, then add the spinach and warmed hollandaise before folding in half. Serve with more Parmigiano Reggiano grated over the top. Try with granary toast.